The Legion of Frontiersmen was founded in London, on Christmas Eve 1904. This new organization was to react as a ready force until the regular Imperial forces could be deployed, or to immediately enlist if called upon. – By the outbreak of war in 1914 the LOF proved their worth and readiness to defend Crown and Empire. The Auckland Star of 1912 reported: “The organization has about 100 squadrons and maritime branches in the United Kingdom, Mediterranean, Canada, British Columbia, Newfoundland, Brazil, Peru, West Indies, Solomon and Fiji Islands, Transvaal, Cape Colony, British East Africa, Nigeria, Egypt, Manchuria, Tientsin, Shanghai, Hongkong, Philippines, Straits Settlements, Burma, Australia and is now helping to raise 12 squadrons and one maritime branch in New Zealand.” Unmentioned in the report were units in the Argentine and the Falkland Islands also active at the time. At the “call to arms” in 1914, Canadian commands of the LOF had formed in the Yukon Territory, the regions of Victoria, Vancouver, the BC interior, Edmonton, Calgary, Lethbridge, Moose Jaw, Regina, Saskatoon, Winnipeg, Thunder Bay, Toronto, Hamilton, Ottawa-Kingston, Montreal, and a number of locations in the Dominion of Newfoundland. In 1915, Lieutenant-Colonel D.P. Driscoll DSO, commanding the 25th Royal (Frontiersmen) Fusiliers in route to British East Africa, writes as the CEO of the Legion of Frontiersmen that “some 7000 men of the Legion are on active service”. He then states “nearly 50 per cent of Princess Patricia’s Canadian Light Infantry are members of the Legion”. In addition to the 7000 Legion of Frontiersmen on active service by 1915, thousands more were to follow before the Great War’s end in 1918. As an example of a single command’s enlistments, a 1916 letter to the 218th (“Irish”) Battalion CEF stated 1600 Legion of Frontiersmen of Edmonton Command had already enlisted for military service. Overall, Frontiersmen enlisted in a variety of regular and irregular military units throughout the British Empire, and by war’s end thousands had perished. Reports have varied from 6000 to 9000 Legion of Frontiersmen deaths. – This author believes it would be more accurate to use the word ‘casualties’ vs. ‘deaths’. 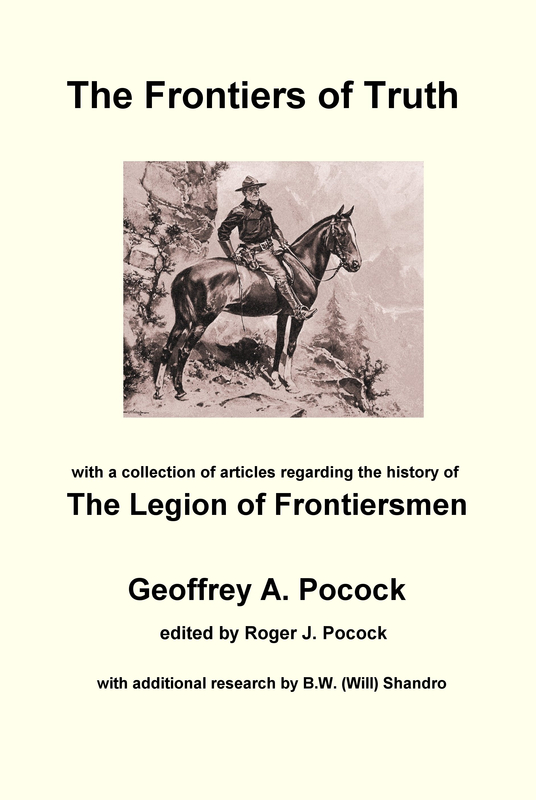 While the vast majority of Frontiersmen enlisted individually in a variety of the Empire’s formations; research has identified some specific regiments and corps having utilized Legion of Frontiersmen. OVERSEAS BEFORE THE CANADIAN ARMY’S ARRIVAL – Regina Command had 50 men make their own way overseas and meet with Kitchener for assignment, while Victoria Command [Elliot’s Horse] sent 80 men overseas also preceding the Canadian Army. 3rd BELGIUM LANCERS – Frontiersmen formed 5 Platoon and saw action early after the declaration of war. These men serving with the 3rd Belgium Lancers were awarded the YSER Medal. REMOUNTS SERVICE – LOF with frontier skills arriving in England were placed breaking and training horses for the British Army. Eventually the Army took formal control of Remounts. METROPOLITAN POLICE MOUNTED RESERVE – A detachment of LOF served City of London as mounted constables throughout WW1. 2nd KING EDWARD’S HORSE – 60 LOF were recruited from Remounts. 25th ROYAL (FRONTIERSMEN) FUSILIERS – Formed for the challenging British East Africa Campaign, the LOF was one of the most colourful, durable and eccentric battalions of WW1. At least one subsequent draft of 300 LOF members was sent in addition to the ongoing replacements. SAMOAN INVASION FORCE – An LOF detail was assigned at request of Fiji Governor. As well it is likely that LOF members from NZ volunteered for the subsequent Samoan Garrison draft in 1915. EAST AFRICAN MOUNTED RIFLES – The LOF formed one of the six squadrons for immediate defence and service in Kenya at the call to arms. CAPE COMMAND, SOUTH AFRICA – The LOF had 268 men ready for service within 48 hours of the declaration of war. NEWFOUNDLAND REGIMENT – Over 150 LOF enlisted in the Newfoundland Regiment, the RNVR or Home Defence Artillery. OTAGO MOUNTED RIFLES, NEW ZEALAND – An LOF squadron rode into the OMR camp to enlist. PRINCESS PATRICIA’S CANADIAN LIGHT INFANTRY – News reports of 600 LOF enlistments, Edmonton and Calgary commands assist with recruitment, rations and transport. 30th FIELD ARTILLERY REGIMENT [OTTAWA] – Surplus LOF applicants to PPCLI enlist as Drivers. 43rd DUKE OF CORNWALL’S OWN RIFLES [OTTAWA] – Surplus LOF applicants to PPCLI enlist as Riflemen. 4th HUSSARS / 8th CANADIAN MOUNTED RIFLES, CEF – A Kingston area troop joined 4th Hussars for overseas service. 19th ALBERTA DRAGOONS – Edmonton LOF gravitate to the area’s mounted unit. 31st (ALBERTA) BATTALION, CEF – Given the news and circumstances of the day, LOF leadership names noted and surplus LOF assembled this battalion would be a logical choice for LOF enlistment. 49th (EDMONTON) BATTALION, CEF – Edmonton’s LOF form ‘D’ Company under their LOF Commandant, who was assigned the ‘D’ Company Commanding Officer. 50th GORDON HIGHLANDERS / 16th BATTALION, CEF – Initially granted wearing their own LOF uniforms as members of the 50th Gordon Highlanders who subsequently reform into 16TH BN. CEF. 210th (FRONTIERSMEN) BATTALION, CEF – Formed at Moose Jaw, Saskatchewan by the LOF recruiting primarily from the Medicine Hat, Alberta area as well as from southern Saskatchewan. EDMONTON BATTALION RESERVE MILITIA – The LOF Northern Alberta Home Guard is reformed into the government’s politically acceptable EBRM. RESERVE MILITIAS IN CANADA – Likely LOF commands in larger Canadian centers also reformed into government sponsored Reserve Militias for home guard purposes – more research is required. CANADIAN ARMY MEDICAL CORPS – As a specific example, the Edmonton LOF was very active in Ambulance training and notably conducts Canada’s 1st ever Home Nursing course to men, and by 1916 has contributed at least 20 Edmonton LOF to the Canadian Medical Corps. AND MANY OTHER REGULAR & IRREGULAR SERVICES of the British Empire. In commemoration of the Legion’s service and of the fallen Frontiersmen in the Great War, the Legion of Frontiersmen had by the 1930s adopted the toast “The 9000” [fallen], and had constructed stone monuments near Hastings Lake Canada, at Ashburton NZ and at National Park NZ. A commemorative honour from the 3rd Belgium Lancers is the Lancer pendant worn on the Frontiersmen tunic. – To those who have served and to the fallen, may “God Guard Thee”. References: Online books, newspaper archives, and the University of Alberta LOF Archives. Article © 2014 Barry William Shandro. All rights reserved. This article may not be reproduced in any form, in part or in full, without prior permission.